Young people from the Americas, Africa, Asia, and Europe were recognized at the PSGFF for original one- to five-minute films that expressed what peace meant to them. Films could be submitted in any format, the organization said, and applicants were judged on meaning as opposed to technical ability. In the age 8 and under category, The Wafalme Kidz from Kenya were awarded for their Kids For Kids song (below), which was shot in the slums of Nairobi, as well as in Haiti. Among 9- to 13-year-olds, the United States’ Mia Ottoviana took home first place with her film Your Voice Matters, which tackles self-image, bullying, and gender issues. In the 14- to 18-year-old age group, Congo’s Alif Buterinote and India’s Namrata Tipimeni tied for first prize with their respective films I Cannot — expressing distress at the kidnapping of children and their recruitment into armed groups in Congo — and I Am Beautiful, an animated short that challenges social beauty norms. 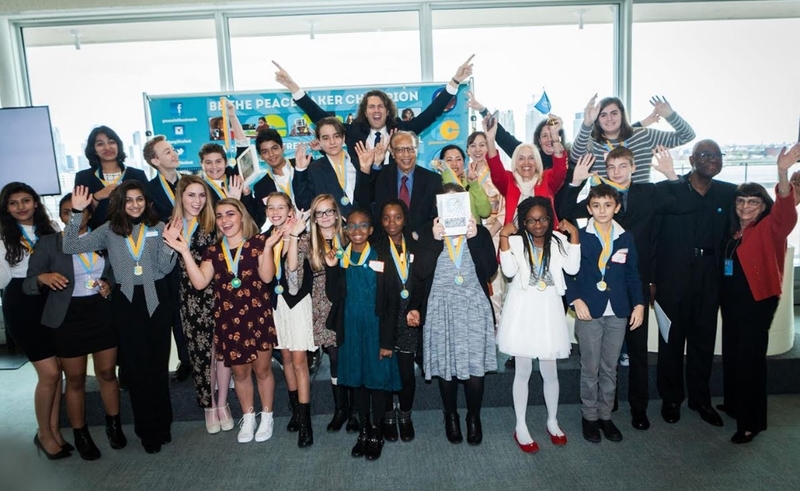 “Our film festival gives young people a voice and a platform to make sustainable peace a realistic goal for the world,” said PCA founder and chairman Carole Krechman in a statement. “The children’s excitement and determination to see change in the face of turbulent times renew my confidence in a common peaceful future.” Bangladeshi diplomat Anwarul Chowdhury served as chair of the film festival’s jurors, and the event was emceed by Tubefilter co-founder Drew Baldwin.